How many times have you struggled to find a place to sit or put your food down at a farmers market or food truck event? The Packable Park was conceived in response to this ubiquitous need for reconfigurable, packable furniture while providing a colorful, engaging space in the urban landscape. 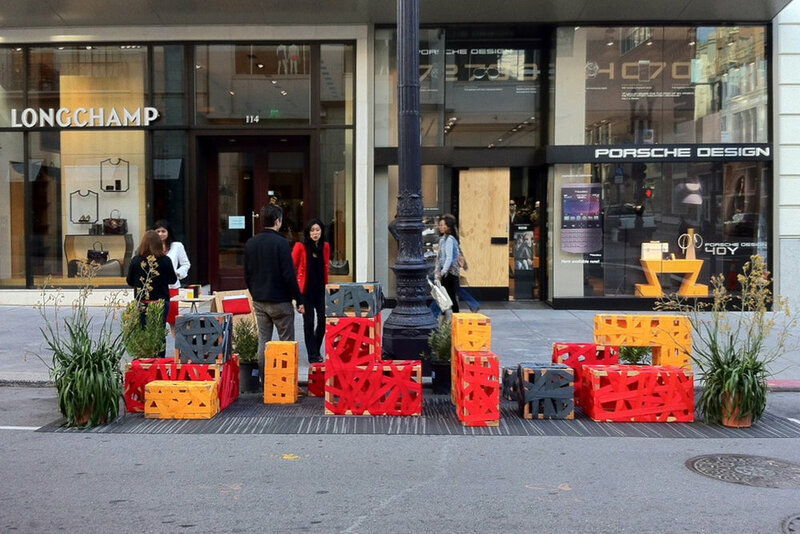 The installation expresses a commitment to the particularity of place and user, as the modular pieces of the parklet are set up and reconfigured in response to the activities and forms of the city around it. The pieces can configure in a variety of ways, packs up into a cube, and easily transports to other locations. The parklet offers a place to stop, sit, experience, and react to the bustle of the ever-changing landscape of San Francisco. The installation featured plants from our friends at Flora Grubb Gardens, carpet from Shaw Contract Group, Twirl & Dip Ice Cream and Del Popolo Mobile Pizzeria food trucks.